Time and again we have heard about the pesticide, glyphosate, making its way into our food chain, our medical treatments – children’s vaccines – and impacting on our life. Monsanto’s attempts to debunk WHO claims that the pesticide is indeed, a “probable carcinogen,” has generally, fallen on deaf ears. However, irrespective if we believe the Agricultural giant’s claims or not, yet again, glyphosate has headed the discussions of eco-awareness, this time in the form of honey. Yes, that’s right, honey. Over the last year, we here at the Anon media faction have highlighted the plight of bees and their necessity in the ecochain, for our livelihoods. Quite simply, without the bee to pollinate, we would very quickly discover the devastating impact on our food supply. 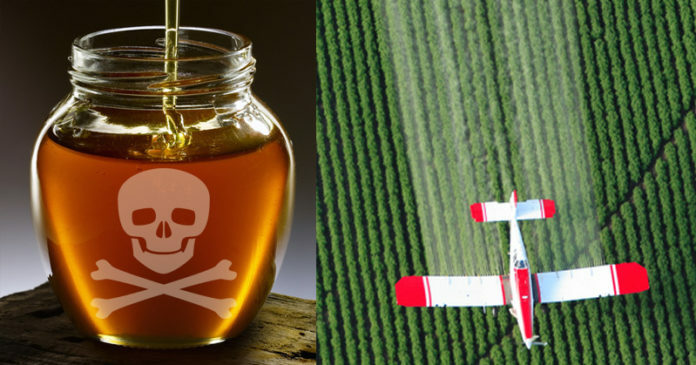 Now, public interest group Right to Know has declared that they have documents proving the FDA has discovered traces of glyphosate in samples of American honey. The Roundup herbicide, which is popular among farmers, particularly for GMO crops nowadays, is slowly leaching further into our food supplies. One scientist, in a leaked document stated that it is more difficult to find honey that is not tainted with the carcinogenic glyphosate. “It is difficult to find blank honey that does not contain residue,” he says. “I collect about 10 samples of honey in the market and they all contain glyphosate.” He further states that organic mountain honey, though still contains the chemicals, contains the lowest traces. Not long ago, we reported on Colony Collapse Disorder – a dying off of up to 40 percent of bee colonies. The record number of deaths have, by some, been attributed to the use of pesticides, one of them being glyphosate. Common sense from here, tells you that those bees which survive the pesticide spraying will naturally carry the chemicals with them as they harvest pollen. As with all things, a process such as this, where the bee and the flower are tainted, naturally, the taint will progress into the end product – in this case, the honey we consume. The concerning angle to this story is the inability for the FDA to accept the risks posed. Alarming as this may be to honey lovers out there, at this stage, official health organizations see no reason to instigate concern. And they won’t. With the merger of Bayer-Monsanto, the chances of anyone scrutinizing the formidable company now, is highly unlikely. This article (Monsanto: Glyphosate Found in Honey) is a free and open source. You have permission to republish this article under a Creative Commons license with attribution to the author AnonWatcher and AnonHQ.com. Big Pharma makes fortunes from dying citizens. Glyphosate and even worse, every other poison these toxic chemical companies make, contaminates everything. It is in our soil, our water, our air, our food, your blood, your breastmilk. It is in everything and that is why I boycott this society, refuse to join it or pay taxes that subsidize this nightmare and I will happily die before I ever do! Boycott this company and all those who facilitate it, which is the entire U.S. government and all of the terrible U.S. western junkfood/fast food. Monsanto is pure evil, adopted from Germany after WW2 and the U.S. even helped them create the gas for the gas chambers. That is how atrocious this place is. It must be stopped and I will give my life fighting this menace, never even getting to live one of my own and I don’t mind because the U.S. can’t even provide a livable life anyway. FIGHT THE GOOD FIGHT AND GIVE IT YOUR ALL, NEVER GIVE UP AND NEVER GIVE IN! MONSANTO/BAYER WILL LOSE AND WE WILL WIN! FOR WE HAVE LIFE ON OUR SIDE! LIFE ITSELF CANNOT BE DEFEATED, FOR IF YOU DEFEAT LIFE, YOU LOSE YOURS! Your crazy my husband loves his family and his country he would not work for this company if there was any truth to what you say. Emm the only WHO report to find glyphosate probably carcinogenic was a branch of the WHO that tested out side normal use. The same group would also find coffee to be far more toxic. The WHO found roundup to be safe in real world uses. As does the vast majority of tests. Roundup allow for conservation agriculture. The future of environmentally friendly farming. Please use science in your views not populist opinions. The plane photo is same as off of http://www.COSUBAN.com the only NON TOXIC fungicide in the world. THE RED AND WHITE PLANE IS NOT A MONSANTO PHOTO REPAET NOT A MONSANTO PHOTO , I sent emails to http://anonhq.com and hope there is a disclaimer at some point. COSUBAN is fighting against Monsanto and Bayer everday and is the only 100% non toxic commercial fungicide in the world trying to battle the giants all alone and now the photo from our cover page is going viral for all the wrong reasons…………PLEASE HELP get a retraction of the photo………..Im getting messages and now a call asking me if this is about me !!!!!!! !